Watch a Cavs/Celtics chess match, what JJ Redick creates with his constant movement, and James Harden's craftiness in isolations. Ty Lue and the Cavs’ coaching staff don’t get enough credit for their Xs and Os. Sure, they have LeBron, but we’ve seen prior coaching staffs fail to use LeBron in ways that maximized his singular talents. Lue’s Cavs, though, run a number of creative sets that stretch the defense to its limit. This was on full display in the Cavs’ recent Sunday afternoon win in Boston, as Cleveland slotted their trade deadline acquisitions into a set they run out of their Elbow series. The Cavs ran it on three straight halfcourt possessions, resulting in eight points (two made threes and a floater) before the Celtics had to call timeout. Why was this so effective? The first thing to note is that the ball is entered to LeBron on the elbow. That will become important in a moment. Then, the Cavs work some corner screening action, with the point guard setting a pin down for the wing in the ball-side corner. In these clips nothing comes of it, but Cleveland has been known to get something out of this action in the past: with LeBron as passer, the defense only has to fall asleep for a moment to give up a layup. 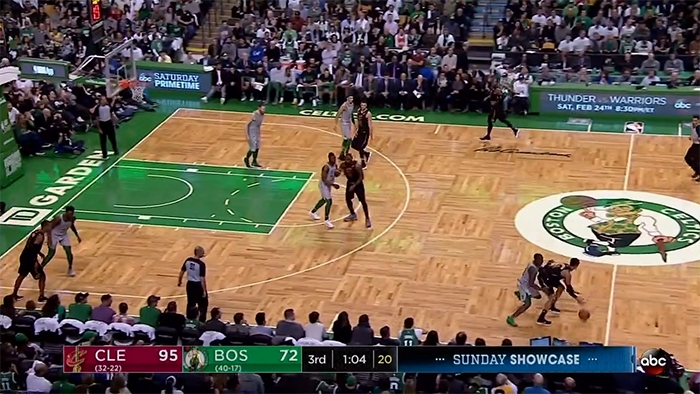 The Celtics defend it well, but it still accomplishes the goal: the corner wing ends up cutting through from the left side of the floor to the right side. That, too, will become important in a moment. With the cut well-defended, Nance comes across to set a ball screen for LeBron. And that’s where all of these factors combine to create an incredibly difficult set to guard. Since LeBron caught the ball at the elbow, it’s a relatively low screen. That puts both James and Nance closer to the basket, giving the defenders less time to react — James can get to the rim in one dribble, and Nance can dive there in a flash. Then there’s the cut from the corner, which enhances the pick-and-roll in two ways. First, it flattens the floor. 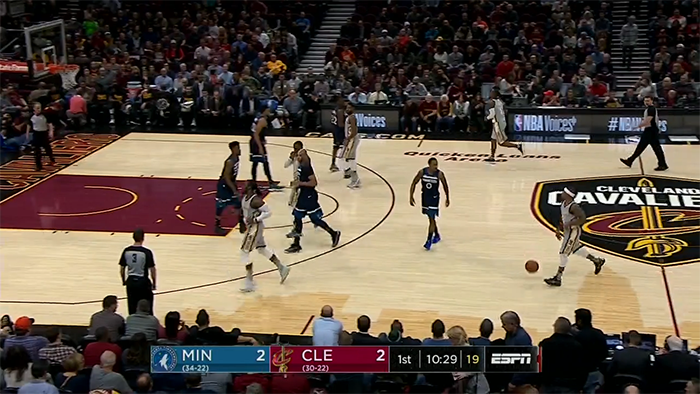 As the pick-and-roll is happening, all three off ball players are along the baseline, so there’s nobody to shrink in and bother LeBron’s dribble. But because Hood is still moving, his man isn’t in the paint to defend, either. He’s chasing Hood. 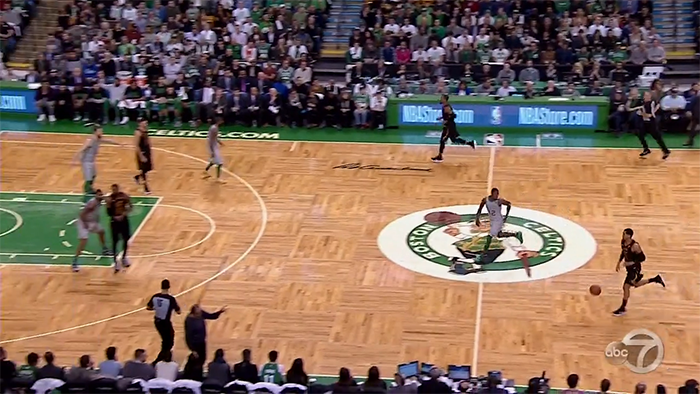 The timing and spacing of it give LeBron a wide open floor to work with. And second, because the cut goes from the weak side of the floor to the strong side, it creates what’s called a *single-side tag*, a difficult situation for the defense. The pick-your-poison nature of the single-side tag means that offenses actively seek out this court positioning. Beyond the bind it places defenders in, it also makes the read easier for the offensive player: he just has to react to the choice the tagger makes, as opposed to having to read multiple defenders at once. That the screen is low means this single-side tag is even more difficult: the weak side help has to tag the roller faster than otherwise. Clarkson knows this, lifts up slightly out of the corner to create even more distance from his defender, and gets two open threes out of it. After these three plays, Boston called timeout to discuss how to defend this set. Let’s take the same opportunity to think: what *is* a good adjustment to make? Stay closer to shooters and you give up the lob to Nance. Switching might make sense, but that likely results in LeBron pulling the ball out and attacking a center with a spread floor. But that, too, is dangerous: if it’s not executed properly then it can give LeBron the half step he needs, and he’ll be right at the basket. 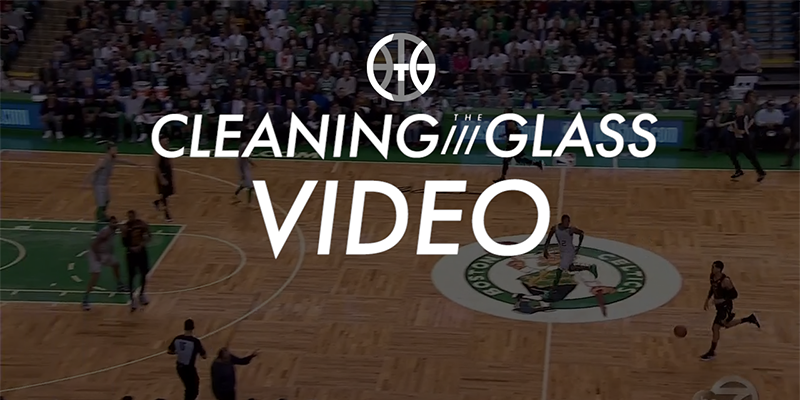 Boston decides to be more deliberate in “weaking”: forcing the ball handler to his left. In my examination of Boston’s defense earlier this year I wrote about how this is their base coverage in the middle of the floor. I’m not sure why they weren’t executing it here — perhaps because the screen was a surprise, or quick enough coming from that angle that it was hard to weak. Regardless, once the Celtics realize what is happening, they decide they can get into the weak. Whether because he has the ball in his weak hand or it’s just the decision he makes, LeBron doesn’t look for the pass but instead ends up taking a tough floater going to his left. And with the play finally stopped, the Cavs turn to another page in their playbook. The sequence gives you a sense of the intricacies of basketball strategy. The Xs and Os chess match between two high level teams, even in a blowout, is fascinating to study and learn from. It’s easy to miss just watching the game casually, but this is the beauty of basketball — it’s not a simple game. The deeper you dig the more is revealed.